Country music singer Patsy Cline embodied the power and appeal of women in country music, and helped open the lucrative industry to future female solo artists. Author: Warren R. Hofstra, ed. 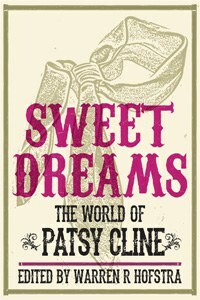 Excerpted from Sweet Dreams: The World of Patsy Cline (footnotes omitted), edited by Warren R. Hofstra. Copyright © 2013 by the Board of Trustees of the University of Illinois (University of Illinois Press). No part of this excerpt may be reprinted, reproduced, posted on another website or distributed by any means without the written permission of the University of Illinois Press. Over the span of her short recording career, Patsy Cline changed her singing style, a move that some have described as her abandoning any country leanings and fully embracing a pop sound. That transition is often identified as the moment that the Nashville Sound sold out and abandoned its authentic identity in a quest for commercial success. A clear illustration of that stylistic change can be heard by comparing her original recording of “Walkin’ After Midnight” to the remake of the song she did in 1961. In the latter version, the tempo is slightly faster, the backup vocalists fill in the sonic texture with tight, close harmonies, and the tic-tac bass lays down a crisp foundation for the song. Cline’s voice is drenched in reverb, reflecting new recording technologies in use by 1961. Floyd Cramer’s slip-note piano dances around the singers. A modulation in the middle of the song from the key of C Major to the key of D-flat Major (at time 1:37 in the recording) reveals the hand of a more sophisticated musical arranger. Most notable, whereas in 1956 Cline’s rhythmic performance of “Walkin’ After Midnight” was relatively straightforward, in 1961 Cline adds extensive back-phrasing, at times singing a full beat behind the band. That prominent back-phrasing untethers the singer from the metric framework of the song and grants her emotional (and rhythmic) freedom in telling the song’s story. It pulls the focus off of the song and puts it instead squarely on the singer as stylist. For Patsy, heavy back-phrasing was a manifestation of her maturation as a performer: she had mastered how to own a song, how to command it, and how to make it belong to her alone, even though she had not written it. Even though Patsy Cline was far from the first country singer to make use of the technique (Kitty Wells, for instance, used it albeit to a lesser extent on some of her ballads), it was undeniably a stylistic trait that normally characterized pop stars and pop ballad singers. For skeptics, that symbolized Patsy crossing into the foreign territory of a pop singer. For fans, it merely symbolized Patsy singing her “own” country classic. Once Patsy Cline committed fully to this new singing style (and consequently scored major hits on the pop charts), her music no longer fit within the stylistic boundaries of traditional country music, but it became wildly popular. In the last few years of her career, she enjoyed resounding commercial success. Yet just as Patsy had needed to untether herself from the rhythms of the songs in order to emerge as a masterful stylist and superstar, later generations of fans would have to untether Patsy the star from the actual musical style in which she recorded in order to reposition her as a classic country singer. The Nashville Sound’s heyday as a musical style remains—to this day—a troublesome era in country music history. A harsh retrospective view of the style emerged in the late 1970s as country music embraced not only the stark twang of outlaw country but also the rebellious sounds of southern rock. From that vantage point, the Nashville Sound was recast as a low point in country’s past, when the genre’s traditions were abandoned in favor of crossover pop artifice. In 1979, authors Bill Ivey and Douglas B. Greene penned an apologist view of the condemned Nashville Sound, arguing that it was a desperate move on the part of the country music industry to save the genre from the onslaught of rock and roll. Such a charged perspective, which casts rock and roll as the evil attacker and the Nashville Sound as a necessary, albeit drastic, sacrificial and compromising defensive maneuver, has since been thoroughly and critically reevaluated by scholars including Joli Jensen. But the Nashville Sound remains vilified in many historical narratives that seek to establish values of authenticity in country music. And that interpretation complicates efforts to view Patsy Cline as one of the genre’s most celebrated stars, since she was also the voice of the Nashville Sound. How the Nashville Sound could be both country music and, simultaneously, popular posed a conundrum to its fans. As a musical genre, country has always been defined in opposition to various “others,” and country fans took pride in their music being distinct from the mainstream pop music. Of all the styles that required careful handling in historical retrospectives, the Nashville Sound was the most problematic because its commercial success had turned it, in effect, into pop(ular) music. Thus, fans of Patsy Cline faced a dilemma: how could they claim Cline and her crossover recordings as a core part of country music, while still adhering to the idea that country was a distinct musical genre, different from pop music? The first step was to separate Cline the star from judgments about larger stylistic trends. In that frame of mind, fans can characterize the Nashville Sound as an inauthentic, sold-out style that undercut country’s traditionalism, while simultaneously adoring its biggest star and leaving her musical reputation untarnished. Yet to her fans, the long-dead Patsy Cline exists primarily in her recordings, and thus the fans must reconcile the musical style of those recordings—irrefutably Nashville Sound—with the historical narrative that describes the Nashville Sound so negatively. The rhetoric of the pop/country dichotomy provides a remarkable solution: the fans’ answer to that question has been to propagate the rhetoric of pop versus country as an intrinsic struggle that persisted throughout Cline’s career. We mentally cordon off the parts of her career and musical style that were too successful or sonically accessible by labeling them as pop and then highlight how those elements were apparently forced upon her against her will, and we cling to the traditionally country aspects of her persona and career as evidence of her “real” identity. That allows us to reauthenticate Patsy Cline through the pop/country dichotomy. Can a Country Singer Be Popular? There is great danger when a country musician actually becomes popular because the genre’s identity is constructed in part on the fierce pride of marginalization. Artists who breach that boundary are inevitably stripped of some degree of country authenticity by a core, tradition-centered fan base. For instance, the Recording Industry Association of America (RIAA) currently lists Garth Brooks as third on its list of top-selling acts of all time, behind the Beatles and Elvis Presley. Yet during his ascent to fame, Brooks became the target of endless diatribes, including that famously scathing accusation that he was the “anti-Hank.” Among many fans, no insult is intended to carry as much vituperation as that of losing one’s country roots and selling out to commercial or crossover interests, which leads to the unsolvable paradox in country music: success actually implies failure. Why did it take so long in Patsy’s short career for her to become a star? The real answer, if there is such a thing, has much to do with the fickle nature of the music industry. Although fans like to believe that natural talent triumphs, reality dictates that it takes a tiresome amount of work and a healthy dose of luck to manufacture a number-one hit record. There is no single reason why she found commercial success briefly in 1956 and then had a long, four-year wait for the next big hit. But when we look back on our beloved Patsy Cline, we inevitably try to explain what held her back from the spotlight we feel she deserved in the late fifties prior to the triumph of “I Fall to Pieces.” The answers to which we turn are usually couched in the struggle to reconcile pop and country in her voice, song selections, interference on the part of her manager or unfair business contracts, musical arrangements, etc., but none of those answers is fully defensible as an explanation. Those responses tell us little about alternate trajectories that Patsy’s career might have taken (because the should-have-could-have-would-have options they imply are always untestable speculation), but those responses tell us much about the way country fans construct narratives of authenticity in country music history against a very complicated notion of “pop music,” as we have explored throughout this chapter. Pop music, with all its abstractions, becomes the foil to which we turn to explain country music. The more interesting question is why it took so many years after her death for Patsy to be widely embraced as a legend of country music, even tipping the scales as a “traditional” star, as in the Newsweek article that pitted her against Taylor Swift. Although Cline was inducted into the Country Music Hall of Fame in 1973, Patsy Cline’s memory lay dormant through most of the 1970s, which is when the harshest assessments of the Nashville Sound emerged. It is no small accident that Cline’s reputation rose to new heights of fame in the 1980s and crested with a biography and Hollywood film about her, accompanied by increased attention from fans and country artists alike. During the early to mid-1980s, country music once again favored a number of extreme pop-crossover styles, and in that context, Patsy Cline offered a unique figure of redemption from country music’s past. In the 1970s, the country music genre found new styles in the form of defiant, antiestablishment revivals of twang through the outlaw movement, country rock, and a streak of mainstream Nashville records that returned to a honky-tonk aesthetic. Yet during that time, Cline’s music was quietly incubating in a number of places, most notably the careers of female country vocalists. Unsurprisingly, the first of these came from a woman whose career started out more in pop than in country. In 1971, Linda Ronstadt’s self-titled third studio album included a live performance of “I Fall to Pieces,” along with several other country covers. At the time, Ronstadt’s songs were not even appearing on the country charts, although that would change within a few years. But she was widely respected as a vocalist. In 1975, Emmylou Harris offered several country retrospectives on Elite Hotel, including a cover of “Sweet Dreams” that became a number-one country hit for Harris. Here again, Harris was weaving Cline’s music into the fabric of country standards. Two years later, Loretta Lynn revived the memory of Patsy Cline with a full tribute album, I Remember Patsy. The album appeared just a few years after Lynn had reached full star status as the first woman to win the Country Music Association’s Entertainer of the Year award (1972) and as the best-known female country singer of the mid-1970s. Owen Bradley produced the tribute album, and the last cut was a lengthy, personal, and nostalgic conversation in which Lynn and Bradley reminisced together about Cline. The album’s cover version of “She’s Got You” topped the Billboard country chart, and another single, “Why Can’t He Be You,” peaked at an impressive number seven. Lynn had always claimed Cline as a major influence as well as a dear friend, and when Lynn’s autobiography appeared in 1976, it pointed yet more attention to Cline’s memory. In that climate, it is unsurprising that Reba McEntire, a young country stylist with a great big voice, included a Patsy Cline cover on each of her first three albums (1977–1980). In 1980, film producer Bernard Schwartz turned Lynn’s autobiography into a major Hollywood film, Coal Miner’s Daughter, and Cline featured prominently in the story line. Thus, at the dawn of the 1980s, Cline was already shifting back into the public’s attention as a major figure in country music’s past. The 1980s began with a country fad fueled by cultural politics and Hollywood. Cowboys were once again heroes in the Reagan era (even the president wore boots), and a sense of patriotic pride and a new social conservatism emerged. Country music offered an all-American soundtrack for this new nationalist identity, best signified by hits such as Lee Greenwood’s “God Bless the U.S.A.” John Travolta and Debra Winger two-stepped their way across the silver screen in Urban Cowboy (1980), and fans who had never before listened to country music turned to the genre in droves. The country music styles during those years incorporated aspects of New Wave, electronica, and pop dance music in their sounds. The resulting country records were wildly popular, and not just with a conventionally country audience. Those country singles began crossing over to the pop charts. Dolly Parton’s “9 to 5” was a number-one hit on the Billboard country chart, but also the number-one hit on the pop chart and the adult contemporary chart. That trend continued, with numbers such as Kenny Rogers and Dolly Parton’s “Islands in the Stream” (number one on both the country and pop charts) and Alabama’s “Love in the First Degree” (number one country and number fifteen pop). Country music was once again popular, to the point that it was undeniably part of pop music. An enormous audience loved the new trends, which left the 1980s country airwaves full of vapid love ballads, hand-clap rhythmic grooves, and catchy, synthesizer-backed guitar hooks, while the radio blared Janie Frickie, Crystal Gayle, Marie Osmond (as a country star! ), and Juice Newton. Dolly Parton was a pop sensation, while Loretta Lynn’s hard country twang could scarcely even crack the top twenty on the Billboard country chart. Country music faced a crisis of genre identity more severe than at any previous time since its first recordings. Where the Nashville Sound had invoked apologists, the era after Urban Cowboy seemed almost beyond salvation. Country music’s problem was in part its own commercial success, which once again threatened the genre with obsolescence as it became pop(ular). Even those who loved the country-pop styles saw the challenges that the genre faced in terms of self-preservation: was there any precedent for country music that was commercially successful and lacking twang? In that context, Patsy Cline’s story offered a path to redemption. Within the pop/country rhetoric, she provided a story of struggle and triumph—country roots and passion surviving a career wrapped in pop aesthetics. She was a country star, and yet her music had landed on the pop charts, her vocals were silky smooth and produced with the full arsenal of available technologies. And she sounded, well, “good.” Unforgettably and irreproachably good. Indeed, Cline’s fame reached new heights in this era. Ellis Nassour penned a detailed biography of her, which she published in 1981. Country songstress kd lang cast herself as a modern-day Patsy Cline and famously covered her songs on lang’s first few albums. And in 1985, Bernard Schwartz drew on his success with Coal Miner’s Daughter to produce the Cline biopic Sweet Dreams, starring Jessica Lange. For country music of the mid-1980s, embracing the Patsy Cline story was a way of affirming that country authenticity could exist in a pop guise, and thereby a way of rationalizing and reconciling country music of the 1980s with notions of tradition. That story, particularly the pop/country struggle through which Patsy triumphed with raw musical talent and an unwavering passion for “real” country music, recast Patsy as a towering legend in country’s history. It also set up the grand irony of Cline’s appearance later as a traditional foil for Taylor Swift’s accused inauthenticity. Four months after Newsweek’s photo essay appeared in 2009, Swift’s “You Belong with Me” topped the country charts and crested at number two on the pop charts, calling to mind the country/pop landscape of the early 1980s, and that of the early 1960s as well. As for Patsy Cline, historians of rock and pop music have conveniently left her out of their narratives, while country’s authors have burnished her already polished sound into a new form of traditional country music. Perhaps the best lesson to take from the recordings she left behind is that country music has always thrived on paradox: tradition is at odds with innovation, authenticity with accessibility, and country music will never be comfortable with its own occasional mainstream popularity. With our luxury of writing and rewriting history, generations of fans and scholars have found a place for Patsy Cline: timeless only after the passage of time and as country as the genre of country music itself ever really manages to be. Jocelyn R. Neal is Associate Professor of Music and Adjunct Associate Professor of American Studies at the University of North Carolina at Chapel Hill. She is the author of The Songs of Jimmie Rodgers (2009), which won the ASCAP Deems Taylor Award. She is the past chair of the Popular Music Group within the Society for Music Theory, and is coeditor of Southern Cultures. In 2012, she was named Director of the Center for the Study of the American South.